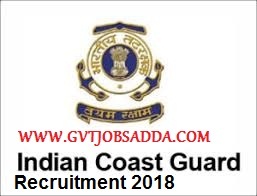 Indian Coast Guard has recently published the recruitment for the post of navik General duty in the Indian coast guard An Armed Force of the union.those candidates who are interested in the Indian coast guard and eligible for general duty please read official notification and apply online before 10-07-2018. Educational Qualification : 10+2 passed with 50% marks aggregate in total and minimum 50%aggregate in Maths and Physics from an education board recognized by Central/State Government. (5 % relaxation in above minimum cut off will be given for SC/ST candidates and outstanding sports personnel of National level who have obtained 1st, 2nd or 3rd position in any field sports events at the Open National Championship/ Interstate National Championship. This relaxation will also be applicable to the wards of Coast Guard uniform personnel deceased while in service). Age Limit : Age. Minimum 18 Years and maximum 22 years i.e. born between 01 Feb1997 to31 Jan 2001 (both dates inclusive). Upper age relaxation of 5 years for SC/ST and 3 years for OBC candidates. Pay Scale : Pay, Perks and Others Benefits. On joining Indian Coast Guard, you will be placed in Basic pay Rs. 21700/- (Pay Level-3) plus Dearness Allowance and other allowances based on nature of duty/place of posting as per the prevailing regulations. Promotion and Perquisites : Promotion prospects exist upto the rank of Pradhan Adhikari with pay scale Rs. 47600/- (Pay Level 8)with Dearness Allowance. Promotion to the Officer cadre is subject to suitability and performance. How To Apply : Applications will be accepted ‘Online only’ from 01 July to 10 July18 till 1700 Hrs. Candidates are to logon to www.joinindiancoastguard.gov.in and click on opportunities button. read before apply all instruction.